Earlier this month The Map House held a curated exhibition of maps with an accompanying talk by Philip Curtis at the London headquarters of Jupiter Asset Management. The stars of the well-attended talk and following discussion were these three pieces relating to the rise and catastrophic failure of the Louisiana Company, an event which bankrupted France and became infamous as the “Mississippi Bubble”. John Law, a Scottish gambler, banker and economist, was one of the more interesting figures in the already colourful world of 18th century finances. After fleeing his native land for France, having killed a man in a duel, he set up a private bank, which after backing from Philippe, Regent to Louis XV, became the Banque Royale. This was, in effect, France’s first National Bank. Law pioneered the issuing of paper money in Europe which he dispensed in the form of loans and withdrawals while only accepting deposits in gold or silver. Law invested his rapidly growing reserves in the Mississippi Company, a company formed to exploit the potential wealth of French Louisiana. In an extraordinary move Law’s Banque Royale took on the whole of France’s national debt in exchange for the Mississippi Company being given a total monopoly over all trade and mineral rights in Louisiana. This was then extended to a monopoly to all of France’s trade outside Europe. Interest in the wildly-projected potential profits fuelled a buying frenzy in the company’s shares. The price of shares rocketed to the point where there wasn’t enough currency left to buy shares, so Law just went on printing more. Law then used the value of Louisiana Company shares to underwrite the value of the paper currency which was in turn frantically being used to buy more Louisiana Company shares, creating a catastrophic feedback loop. Wholly overlooked in this speculative madness was the complete lack of any actual profits coming out of Louisiana. 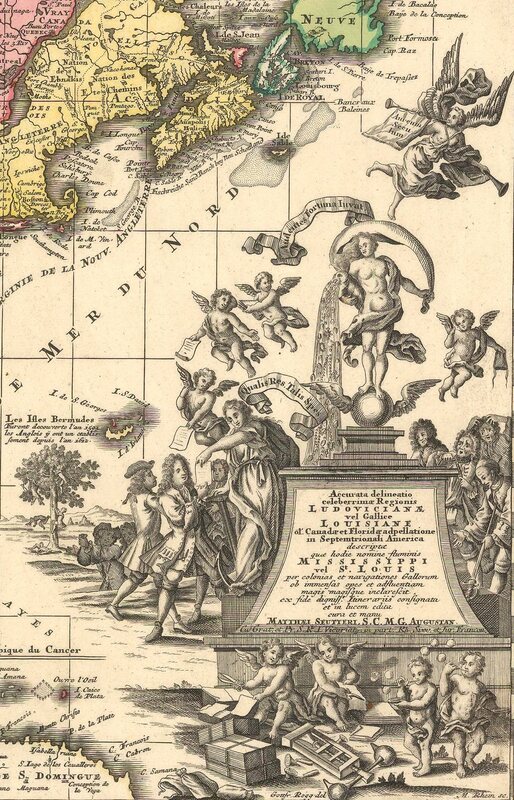 Despite the vast size of the territory, stretching from Spanish Mexico to French Canada, the total European population of Louisiana in 1718 was just 700. So desperate was the need for colonists that from September, 1719, male prisoners were released from Paris jails on the condition that they would marry a prostitute and travel together to Louisiana. The newly-married couples were chained together and taken straight to the port of embarkation. Inevitably the Bubble burst when profits failed to materialise and the Mississippi Company shares became worthless, dragging Law’s paper currency down with them, and throwing France into bankruptcy once more. John Law fled into exile for a second time and eked out his remaining years as a professional gambler in Venice. 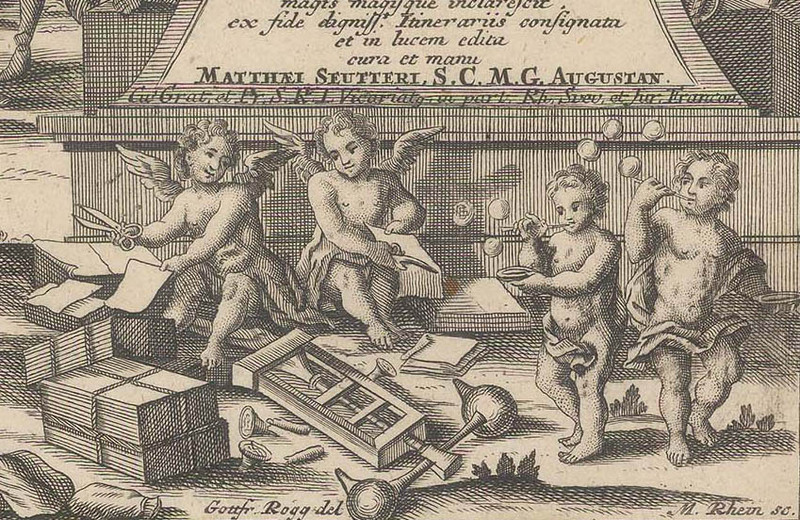 The map’s cartouche (shown above) is illustrated with little putti blowing bubbles and printing share certificates. On one side of the figure representing the non-existent wealth of Louisiana, are the happy stockholders clutching their share certificates, on the other the ill-advised and despairing investors are in rags. 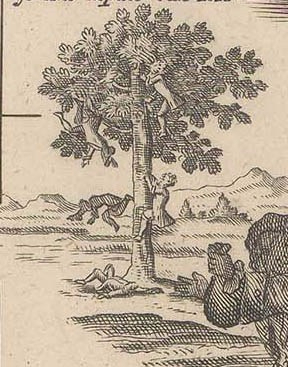 In the background one can see frantic figures shaking and falling out of a “money tree”. The collapse of the French economy after the Mississippi Bubble burst met with little sympathy amongst the nations of Europe. The Netherlands, in particular, took great pleasure from the suffering of their neighbour and frequent rival, as illustrated by the two contemporary Dutch satires shown below. The image above is a contemporary illustrated Dutch satire on the collapse of the Mississippi Bubble entitled “Mississippi, or the famous imaginary golden land”. In the centre is an idealised view of the Mississippi showing French merchants attempting, without any noticeable success, to trade with the Native Americans. The four surrounding vignettes illustrate the story. In the first, the bankrupt French king lies in bed with rats gnawing at his paper debts, while in the second, John Law is presenting his grand idea to the king. The final scenes show the ill-advised investor first having his profits delivered by wheel-barrow then in a state of destination after the bursting of the bubble. This is another contemporary Dutch satire about the Mississippi Bubble represented by an allegorical land in the shape of a man’s head wearing a fool’s cap. The relish with which the Dutch regarded the financial woes of their powerful near-neighbour and occasional ally was no doubt strongly influenced by their conflict with France in the recent War of the Spanish Succession. The British reaction to the Mississippi Bubble was more muted as they were in a similar situation themselves to due to the simultaneous implosion of their own South Sea Bubble. For more information about any of the maps illustrated above, or to continue the discussion, please visit our website at www.themaphouse.com or email us at maps@themaphouse.com.